If you haven’t yet seen a supermoon, you’ve missed out on a super, spectacular sight. An astrologer, Richard Nolle, named the supermoon over 30 years ago, but it’s been only the last few years that this name for perigee has been used to describe the full moon. This art project is our tribute to this outstanding sight. A supermoon is a full moon at its closest approach to the Earth. The average distance, as the moon nears the Earth each month, is about 238,000 miles. During a supermoon, the distance becomes less than 224,851 miles. The supermoon appears bigger and brighter than an ordinary full moon. The directions for this project, Spectacular Supermoon, is found in the 5th Grade Projects Gallery in the sidebar. Click on the image above for a full view of the picture. 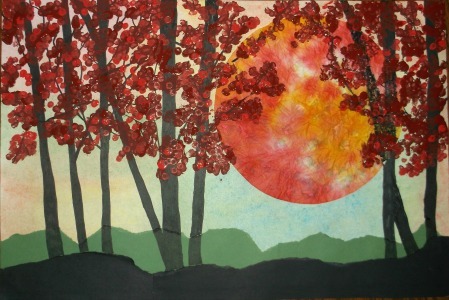 This entry was posted in Categories and tagged 5th Grade, art, coffee filter, craft, for kids, full moon, moon and trees, project, supermoon, supermoon art project. Bookmark the permalink.